Prepare your feet properly for the marathon season. Things are finally hotting up – well, at least in the world of extreme running, if not the weather! Take things slowly and prepare your feet gradually for the abuse that lies ahead. They are going to take a pounding over the next few weeks and if you don’t prepare carefully, you could do some damage – most problems are reversible, but the symptoms could stop you competing. Not many of us like it hear it BUT stretching before starting any exercise is vital to keep injuries at a minimum. Choose the right type of footwear for the specific terrain – there are so many styles and brands of running shoes, all promising different things, it can be very confusing, try contacting your podiatrist for advise. Ask a trainer to suggest the best way to build up your routine so all leg muscle groups are engaged slowly and completely warmed up before the long distances are tackled. 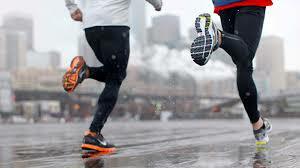 Shin splints: Shin splints, which are painful and appear at the front and inside of the leg, are often caused by running on hard surfaces, over striding, muscle imbalance, or overuse. Shin splints can also be related to the shape and structure of your feet. Treatment includes rest, stretching, changing your running technique, and rebalancing foot mechanics with special show inserts. Physiotherapy can also be helpful. If you begin to feel this type of pain, slow down, take shorter strides, and see a podiatrist at your first opportunity. Stress fractures: A stress fracture is a tiny or incomplete crack in a bone that is often caused by overuse. Stress fractures occur most frequently in the foot and ankle, so your podiatric physician is well trained to diagnose and treat this problem. Signs of a stress fracture are pain that increases with activity and decreases with rest, pain that increases over time or pain that persists even at rest. Often a stress fracture will result in swelling and a spot that feels tender to the touch. Prompt diagnosis and treatment of a stress fracture can often prevent further injury. A podiatrist can determine your best treatment with x-ray and a physical examination. Many stress fractures can be treated with rest, ice and over-the-counter pain relievers. For most people, an appropriate period of rest will be sufficient for the bone to heal, but like all fractures, the bone can take up to 8 to 10 weeks to heal completely. In other cases, your podiatrist may need to immobilise the affected bone with a cast, cast boot, fracture shoe, or a splint. Surgical intervention may be suggested if other, more conservative treatments are not effective. Blisters and nail problems: Runners often have blisters and nail problems but with a little maintenance and care, they can be avoided or minimised, so that they don’t limit your ability to keep up your training routine. Blisters are caused by skin friction. Don’t pop them. Apply moleskin or an adhesive bandage over a blister, and leave it on until it falls off naturally in the bath or shower. Keep your feet dry and always wear socks as a cushion between your feet and shoes. If a blister breaks spontaneously, wash the area, apply an antiseptic, and cover with a sterile bandage. Nails can become bruised or broken. Keep nails short to limit damage and if trauma occurs remove any loose pieces of nail by cutting with nail scissors and filing smooth with an emery board. Ingrown nails are nails whose corners or sides dig painfully into the skin, often causing infection. They are frequently caused by improper nail trimming but also by shoe pressure, injury, or poor foot structure. Runners are particularly susceptible to nail problems, and long-distance runners often lose some of their toenails entirely while they are training. If an ingrown portion of the nail is painful or infected, your podiatrist can remove the affected portion to allow for healing. It is possible to permanently remove the offending portion of the nail to prevent occurrence. Soaking in warm salt water can relieve the discomfort of ingrowing toenails and prevent infection. Marathon running can give you a real sense of achievement and an increased feeling of wellbeing – just remember to take care of the most vital component to a successful fun run – your feet!